Eagerly anticipated changes to electoral boundaries have been announced, raising expectations that the next general election will be called soon, possibly in September. But the traditional redrawing of constituency boundaries ahead of every election proved to be milder than some had expected this time around. 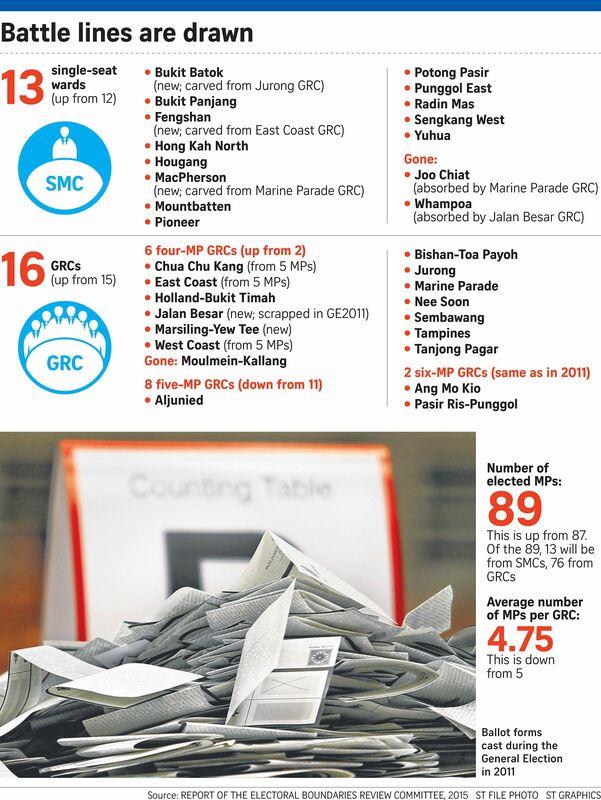 They also continue reforms to the system Prime Minister Lee Hsien Loong had initiated ahead of the 2011 General Election, to reduce the average size of a Group Representation Constituency (GRC) and have more Single-Member Constituencies (SMCs). Some one in five voters, or 19 per cent of voters, will find themselves in a new constituency. This figure is fewer than the 30 per cent of voters affected by boundary changes ahead of the 2011 election. Two more seats are also up for contest. The Electoral Boundaries Review Committee, in its report released yesterday, recommended a rise in the number of elected Members of Parliament from 87 to 89. Prime Minister Lee said in a Facebook post: "To make smaller GRCs and more SMCs, some boundaries have had to be changed." The changes also take into account new housing estates. The report said: "The committee reviewed all the existing electoral divisions, taking into account their current configurations, population shifts and housing developments since the last boundary delineation exercise." Taken as a whole, analysts said, they keep the playing field level, although several areas that saw close contests from the opposition Workers' Party (WP) in 2011 - Joo Chiat SMC and parts of Moulmein-Kallang GRC - have been absorbed into nearby constituencies. In keeping with recent practice, the boundaries of opposition-held seats have remained unchanged: Aljunied GRC, as well as Hougang and Punggol East SMCs. Political scientist Lam Peng Er of the National University of Singapore's East Asian Institute said of the report overall: "By and large, it's a very modest shift, nothing too radical." But WP council member, Non-Constituency MP Gerald Giam, said many of the areas the party contested had been split up. There will now be six four-member GRCs, up from two, and eight five-member GRCs, down from 11. Ang Mo Kio GRC and Pasir Ris-Punggol GRC, helmed respectively by PM Lee and Deputy Prime Minister Teo Chee Hean, remain the only two six-member GRCs. But five-MP East Coast GRC, which saw the closest fight in 2011 from a WP team, will now have four MPs, with Fengshan SMC hived off. Four-MP Moulmein-Kallang GRC is no more, as Jalan Besar GRC makes a comeback, taking in Whampoa SMC and parts of Tanjong Pagar GRC. Most of Moulmein ward, under Transport Minister Lui Tuck Yew, has been split up between four surrounding GRCs. A new four-MP Marsiling-Yew Tee GRC has also been formed in the north-west, from parts of Chua Chu Kang GRC and Sembawang GRC that have seen significant population growth of late. Parts of the sprawling Pasir Ris-Punggol GRC have been moved westwards to Ang Mo Kio GRC, with changes also being made to Nee Soon GRC and Sembawang GRC. As for the SMCs, 10 of the 12 existing single seats remain on the map. Two more former SMCs make a return: Bukit Batok has been carved out of Jurong GRC, and MacPherson from Marine Parade GRC. "Wherever the boundaries may be drawn, MPs should serve the residents they represent to the best of their ability," PM Lee said yesterday. "And voters should support the candidates or teams who will best represent their interests, both in the constituency and as the Government of Singapore." THE OPPOSITION AND OTHER REACTIONS: No changes to areas held by WP // Opposition politicians weigh their options // Party responses // Lina Chiam wants to return to Potong Pasir // East to see keenest fights, say observers // Analysts: Why keep six-member GRCs?